As I understand it, Illinois State University's School of Theatre needed a venue to showcase its grad students in acting, and they chose Heartland Theatre in Normal. 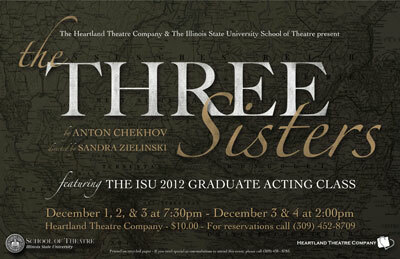 So, for the first time, Heartland will host a play starring ISU's entire group of MFA actors. A few of them have done shows together at ISU and almost all of them played roles in last summer's Illinois Shakespeare Festival. But all together? Nope. This showcase means that interested theater-goers will get the chance to see these actors before they break big. This is a very good group, and they've each turned in powerhouse performances, meaning they could very well end up in major companies or on the big screen. Will one among them be the next John Malkovich, Laurie Metcalf or Rondi Reed? Only time will tell, but you can see what you think this week. The play is Chekhov's "The Three Sisters," directed by ISU professor Sandi Zielinski, with Jessie Dean, Kate McDermott and Melisa Pereyra as the titular sisters, and their fellow grad students Jeb Burris, Michael Gamache, Josh Innerst, Molly Rose Lewis and Zach Powell taking on other major roles in the Chekhov classic. Frequent Heartland actors Dean Brown ("Proof"), David Krostal ("A Tuna Christmas") and Ann B. White ("Too Many Air Conditioners") will join them, as will Henry Woronicz, Head of Graduate Acting at ISU. "The Three Sisters" has been done many times with celebrity casts, like Judith Anderson, Katherine Cornell and Ruth Gordon on Broadway back in 1942, or Amy Irving, Jeanne Tripplehorn and Lili Taylor back on Broadway in 1997. (For trivia lovers, that last production also featured Justin Theroux, Jennifer Aniston's current beau, in a small role.) There have been other productions memorable for their casting, as well, with Vanessa, Lynn and Jemma Redgrave playing the sisters in London in 1991 and Sorcha, Sinead and Niamh Cusack taking the roles in Dublin in 1990. 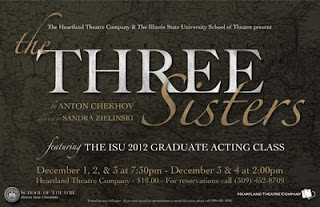 This ISU MFA "Three Sisters" promises to focus on the acting and the characters, as our three girls marooned in the provinces yearn for Moscow and the more cultured life they remember when they lived there. Oldest sister Olga is a teacher who has reluctantly given up on the idea of marriage or romance, while moody Masha remains artistic and passionate, even though she lives in an unhappy marriage. Youngest sister Irina is more naive and the object of several crushes in the men around her. Their lives are complicated when an army artillery battery comes to town and stays awhile, with the dashing Vershinin, someone Masha finds fascinating, as commanding officer. Although there is a special "students only" preview performance tonight, official performances begin tomorrow night at Heartland Theatre. This production is not part of Heartland's regular season, so season passes may not be used. All tickets are $10. For reservations, email boxoffice@heartlandtheatre.org or call 309-452-8709. Performances are: Thursday, December 1, Friday, December 2 and Saturday, December 3 at 7:30 pm, and Saturday and Sunday, December 3 and 4, at 2 pm. That's five performances only of this classic play with a fabulous cast. That role (without the name, of course) is played by Sarah Stone Innerst in this cast. The cast of the 1997 Broadway production is just fascinating. David Strathairn as Vershinin would be enough to get me to the theater, but then there was Billy Crudup as Solyony, Eric Stoltz as Tuzenbach, Paul Giamatti as Andrei, David Marshall Grant as Kulygin and Jerry Stiller as Chebutykin. And Calista Flockhart as big bad Natalya! Kathleen, I had no idea! Molly Regan is a dear friend (I actually know her through her husband, to whom I owe everything as a writer about music: http://www.conradlosborne.com ). I saw her at Steppenwolf as the rich lady in "You Can't Take It With You," and as Amanda in "The Glass Menagerie." Can Netflix Save "Arrested Development"?